This is one of Andrew’s favorite My Obstacle Course station activities and when I think back to when I taught kindergarten, it was one of their favorite “center” activities as well. There is just something about stamping that children seem to enjoy, perhaps it seems like grown-up activity or is something they rarely get to do. I’m not sure why, but stamps have always been a hit with the children I’ve worked with. Note: “Centers” are stations that teachers set up and the children rotate through in order to strategically work on different skills. While Andrew is extremely strong, his grasp is weak and so I am always on the lookout for ways to build strength in this area. When using a stamp, you have to grasp the stamp, push the stamp into the ink and then apply pressure when stamping on paper. 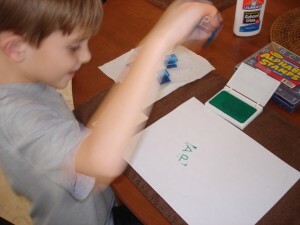 Grasping a stamp helps build fine motor skills by squeezing fingers together to hold the stamp evenly. 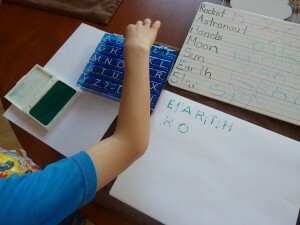 I found these letter stamps at a teacher supply store and knew that with Andrew’s love of letters and words, they would be perfect for motivating him to work on this fine motor weakness while he’s focused on something that is a strength. Note: The reverse of this would also be true so if you have a child who has great fine motor strength but struggles with letters and words. 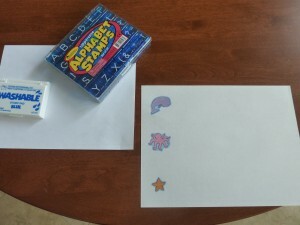 When setting up my stamping station as part of My Obstacle Course, I provide the stamps, stamp pads (I made sure to get washable ink so I wouldn’t have to worry about finding permanently stamped letters on the floor or tables. 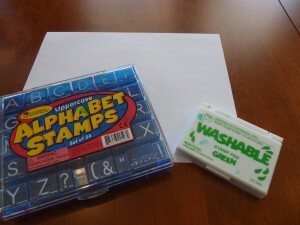 ), paper to stamp on and also paper towels to use either to wipe off ink when switching ink colors or as a place to “hold” the stamps until you are ready to place them back in the case. 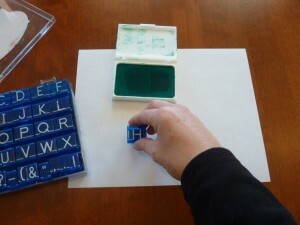 If you are looking for a fun way to engage with your child while incorporating fine motor skills and literacy, I encourage you to try setting up a stamping station!